Westchester is a census-designated place (CDP) and unincorporated community in suburban Miami-Dade County, Florida, United States. The population was 29,862 at the 2010 census. Westchester is located at 25°44′49″N 80°20′13″W﻿ / ﻿25.746978°N 80.336873°W﻿ / 25.746978; -80.336873, with an elevation of 3 feet (0.91 m). As of the census of 2000, there were 30,271 people, 9,764 households, and 7,947 families residing in the CDP. The population density was 7,539.9 people per square mile (2,914.6/km2). There were 9,938 housing units at an average density of 2,475.4/sq mi (956.9/km2). The racial makeup of the CDP was 93.78% White (13.7% were Non-Hispanic White,) 0.61% African American, 0.04% Native American, 0.51% Asian, 2.81% from other races, and 2.23% from two or more races. Hispanic or Latino of any race were 85.31% of the population. There were 9,764 households out of which 28.0% had children under the age of 18 living with them, 60.5% were married couples living together, 15.7% had a female householder with no husband present, and 18.6% were non-families. 14.8% of all households were made up of individuals and 8.6% had someone living alone who was 65 years of age or older. The average household size was 3.07 and the average family size was 3.33. In the CDP, the population was spread out with 18.7% under the age of 18, 7.2% from 18 to 24, 26.7% from 25 to 44, 24.4% from 45 to 64, and 23.0% who were 65 years of age or older. The median age was 43 years. For every 100 females, there were 87.2 males. For every 100 females age 18 and over, there were 83.4 males. The median income for a household in the CDP was $40,762, and the median income for a family was $44,863. Males had a median income of $29,629 versus $24,235 for females. The per capita income for the CDP was $17,264. About 8.5% of families and 11.8% of the population were below the poverty line, including 13.0% of those under age 18 and 13.0% of those age 65 or over. As of 2000, speakers of Spanish accounted for 88.81% of residents (many of whom also speak English); those who spoke only English accounted for 10.78% of the population. The Miami-Dade Fire Rescue operates Station 3 Tropical Park in Westchester. The community of Westchester is home to eight public schools administered by Miami-Dade County Public Schools, four Catholic private elementary and secondary schools, one private Roman Catholic college, and one public university. The Miami Hoshuko, Inc. (マイアミ補習校 Maiami Hoshūkō), a supplementary weekend Japanese school, holds its classes at the Iglesia Bautista de Coral Park ("Coral Park Baptist Church") in Westchester. The school offices are located in Doral. ^ "Westchester, FL Profile: Facts, Map & Data". florida.hometownlocator.com. ^ "Demographics of Westchester, FL". MuniNetGuide.com. Retrieved 2007-11-12. 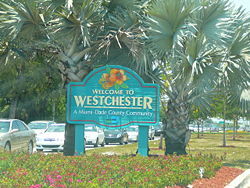 ^ "MLA Data Center Results of Westchester, FL". Modern Language Association. Retrieved 2007-11-12. ^ "Ancestry Map of Cuban Communities". Epodunk.com. Retrieved 2007-11-12. ^ "Ancestry Map of Nicaraguan Communities". Epodunk.com. Retrieved 2007-11-12. ^ "Ancestry Map of Colombian Communities". Epodunk.com. Retrieved 2007-11-12. ^ "Stations & Units." Miami-Dade Fire Rescue. Retrieved on September 16, 2012. ^ "Coral Park Elementary School - Home". coralparkelementary.dadeschools.net. ^ "Emerson Elementary School". emerson.dadeschools.net. ^ "Rockway Elementary - Home of the Falcons". rockwayelementary.dadeschools.net. ^ "St. Agatha Catholic School". stagathaonline.org. ^ a b c d e "2010 Block Census Map Westchester, Florida" (Archive). U.S. Census Bureau. Retrieved on April 30, 2014. ^ Home page. St. Brendan High School. Retrieved on January 3, 2015. "2950 SW 87 Avenue, Miami, FL 33165"
^ a b "ホーム" ("Home"). Miami Hoshuko. Retrieved on April 30, 2014. "借用校・校舎 Iglesia Bautisita de Coral Park 8755 SW 16 Street Miami, FL. 33165" and "補習校事務所 Miami Hoshuko, INC. 3403 NW 82 Ave, Suite 340 Miami, FL. 33122"
^ "Map of the City of Doral Archived 2012-09-16 at WebCite." (Archive) City of Doral. Retrieved on September 16, 2012.